I’m not going to lie to you — I spend a lot of time in front of my computer. In my home office, at the library, and yes, on my couch in the living room. Sitting up, slouching, lying down…it’s all fair game. It would be fair to say that I am not an example of how to work healthily. But I have a desire to work in a healthier environment, which you may have guessed from my recent posts on ergonomics and how to stay healthy and productive at your computer. That theme continues today as I tackle what has certainly been the biggest health-related issue pertaining to computer usage in my personal experience — repetitive strain injuries. Please note that I am no doctor and the advice contained below is not intended to be comprehensive. If you have concern for your health or are in any doubt as to what you should be doing, please consult your physician. RSIs can be caused by many things. You are probably familiar with the term (and the feeling), but a repetitive strain injury (or RSI) is “a potentially debilitating condition resulting from overusing the hands to perform a repetitive task, such as typing, clicking a mouse, or writing“. 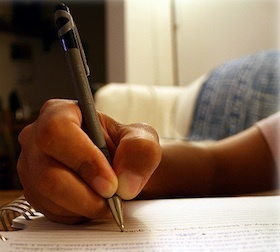 It isn’t just limited to computer usage — for instance, I remember that my writing hand would get sore after returning to school from summer vacation, due to all the writing I was doing. But for us computer types, RSIs are likely to arise out of our actions in front of a screen. If you make a living out of using a computer, you do not want to be in pain for the rest of your life. So now is the time to take action — before it is too late. Set yourself up with an ergonomic workstation — this is perhaps the biggest improvement you can make. 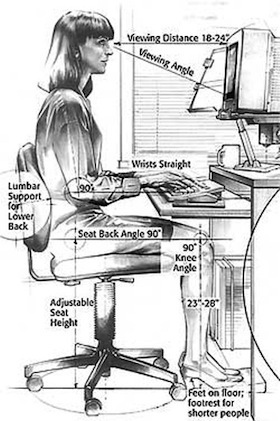 Check your posture — there’s no point using an ergonomic workstation if you slouch. Check your typing position — arms should be comfortably by your side, wrists should be straight, hands should float about the keyboard. Take regular breaks — at least once every hour, get up from your chair and have a brief walk. Stretch your limbs and relax your eyes. This will help you to be more productive as well as benefit your health. Exercise regularly — stronger muscles are less likely to break down. Relax! If you are tense at your workstation, that is hardly going to benefit you in any way. If you feel tense, take a break. If you already suffer from RSI, all is not lost. The damage caused can be mitigated and even reversed if you take proactive steps. Type less — easier said than done, you might reasonably say. 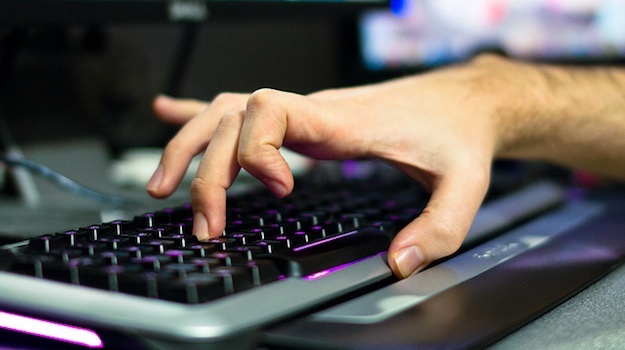 But in reality, if you take a close look at your computer use habits, you will find that there are many ways in which you can reduce the amount of typing that you do. Use dictation software — this is perhaps the biggest change you can make. Dictation software technology has come a long way (check Dragon out), and although it is far from perfect, it can serve as a superior alternative to crippling limb pain. Revert to “real life” — instead of sending an email, pick up the phone. Or if that person is just down the corridor, use one of your hourly breaks to pay them a visit rather than add yet another unresolved issue to their inbox. Rest — if something hurts, try to avoid using it as much as possible. It may sound blindingly obvious, but it is all too easy to pretend that it is not an effective action. …if you are in any doubt as to your health, please contact your physician for professional medical advice. RSIs are not something you want to fool around with and can take years to develop, so even if you feel like you are not currently at risk, it would be wise to start following the above advice now. Do you have any techniques for combating or preventing RSIs? What do you do to soothe the pain? Let us know in the comments section! I am a student doing a report on repetitive strain injuries in the office would it be alright if I use your illustration in my report for reference? I am currently assembling a Google map with physicians and physical therapists who have substantial knowledge of Repetitive Strain Injuries. I was wondering if you know any good medical people I could additionally recommend on my map?